The standard defines a log as all natural wood that retains the original shape of the bole (trunk) of a treee whether raw, partially processed, or fully processed. The specific requirements for logs cover shortwood and longwood. Normally up to about 2.5 m (100 in) in length. No longer than 4.9 m (16 ft) in length. Also called Long Logs or Treelength. Some stacks may be made up of both shortwood and longwood. Any stack that includes shortwood must follow the shortwood securement requirements. Exception: If shortwood is embedded in load of longwood, it can be treated as longwood. 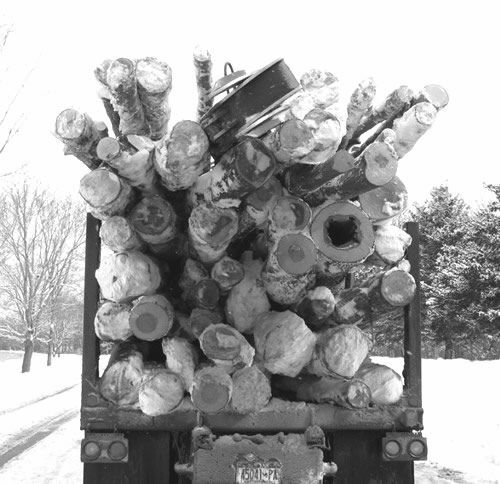 Vehicle must be designed and built, or adapted, for transportation of logs. 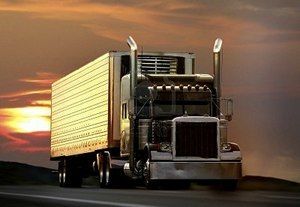 All vehicle components must be designed and built to withstand all anticipated operational forces without failure, accidental release, or permanent deformation. If stakes or standards are not permanently attached to the vehicle, secure the stakes so that they do not separate from the vehicle. Use tiedowns in combination with bunks, stakes, or standards and bolsters to secure the load. All tiedowns must have a working load limit not less than 1,800 kg (4,000 lb.). Tension tiedowns as tightly as possible but not beyond their working load limit. A vertical barrier across a vehicle to prevent forward movement of cargo. A specialized container, primarily used to contain and transport materials in the waste, recycling, construction/demolition, and scrap industries, which are used in conjunction with specialized vehicles, in which the container isloaded and unloaded onto a tilt frame body by an articulating hook-arm. The depression formed between two cylindrical articles when they are laid with their eyes horizontal and parallel against each other. In terms of cargo securement, what is a 'well'? A female housing fixed to the side or ends of a vehicle to receive a stake or peg, and may also be used as an anchor point. A device placed between the deck of a vehicle and car or between articles of cargo, intended to provide greater friction than exists naturally between these surfaces. A reusable, transportable enclosure that is especially designed with integral locking devices that secure it to a container chassis trailer to facilitate the efficient and bulk shipping and transfer of goods by, or between various modes of transport, such as highway, rail, sea, and air. A vehicle especially built and fitted with locking devices for the transport of intermodal containers. Which of the following are covered by the specific log securement requirements? Firewood, stumps, debris, other short logs, and longer logs. All of these can be handled according to general cargo securement rules. Loads of no more than four processed logs. Logs unitized by banding or other comparable means. A vertical barrier placed directly behind the cab of a tractor to protect the cab in the event cargo should shift forward. A vertical barrier across the front of the deck of a vehicle to prevent forward movement of cargo. In what circumstance can shortwood be treated as longwood? When it is embedded in a stack of longwood. Right after it is cut down. When it is painted green on the ends. When it is stacked long-ways on the trailer. Half the length of the trailer. What is the minimum WLL of a tiedown used to secure logs?